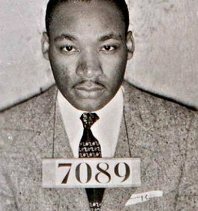 To mark Dr. Martin Luther King Jr.’s birthday, I’ve been reflecting on the principles of nonviolence that he learned during the historic yearlong bus boycott in Montgomery, Ala.
After Rosa Parks refusal to sit in the back of the bus, broke the segregation law and was arrested on Dec. 1, 1955, the African-American leadership in Montgomery famously chose young Rev. Dr. Martin Luther King Jr. to lead their campaign. He was an unknown quantity. Certainly no one expected him to emerge as a Moses-like tower of strength. No one imagined he would invoke Gandhi’s method of nonviolent resistance in Christian language as the basis for the boycott. But from day one, he was a force to be reckoned with. With the help of Bayard Rustin and Glenn Smiley of the Fellowship of Reconciliation, Dr. King articulated a methodology of nonviolence that still rings true. It’s an ethic of nonviolent resistance that’s also a strategy of hope, which can help us today in the thousands of Montgomery-like movements around the world, including the Occupy movements and the ongoing Arab Spring movements. That’s a tough pill to swallow, but King insists there is power in the acceptance of unearned suffering love, as the nonviolent resister Jesus showed on Calvary and Dr. King himself showed in his own life and death. Nonviolence avoids not only external physical violence but also internal violence of spirit. It practices agape/love in action. For King, this agape/love is the power of God working within us, Watley explains. That is why King could exhort us to the highest possible, unconditional, universal, all-encompassing love. King the preacher believed God worked through us when we used the weapon of nonviolent love. Nonviolence is based on the conviction that the universe is on the side of justice. ‘The believer in nonviolence has deep faith in the future,’ King writes. ‘He knows that in his struggle for justice he has cosmic companionship. There is a creative force in this universe that works to bring the disconnected aspects of reality into a harmonious whole.’ King’s philosophy, spirituality, theology and methodology were rooted in hope. Information gathering. We need to do our homework and learn everything we can about the issue, problem or injustice so we become experts on the topic. Education. Then we do our best to inform everyone, including the opposition, about the issue and use every form of media to educate the population. Personal commitment. As we engage in the public struggle for nonviolent social change, we renew ourselves every day in the way of nonviolence. As we learn that nonviolent struggles take time, we commit ourselves to the long haul and do the hard inner work necessary to centre ourselves in love and wisdom and prepare ourselves for the possibility of rejection, arrest, jail or suffering for the cause. Negotiations. We try to engage our opponents, point out their injustice, propose a way out and resolve the situation, using win-win strategies. Direct action. If necessary, we take nonviolent direct action to force the opponent to deal with the issue and resolve the injustice, using nonviolent means such as boycotts, marches, rallies, petitions, voting campaigns and civil disobedience. Dr. King’s principles and methodology of nonviolence outline a path to social change that still holds true. In his strategy, the ends are already present in the means; the seeds of a peaceful outcome can be found in our peaceful means. He argues that if we resist injustice through steadfast nonviolence and build a movement along these lines, we take the high ground as demonstrated in the lives of Jesus and Gandhi and can redeem society and create a new culture of nonviolence.